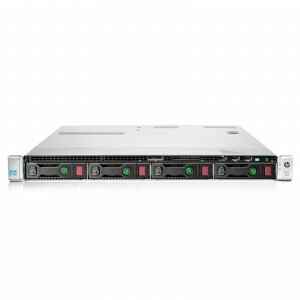 A refurbished HP ProLiant DL360e Gen8 Server from Bargain Hardware offers you new generation performance at an unbelievably cheap price. Part of the HP essential range, this compact 1U delivers the engineering, reliability and performance excellence that is expected from the world’s bestselling server series. The emphasis on efficiency is key with this economic server, featuring Low-Power memory, processors and Platinum Plus 80PLUS PSUs the DL360e G8 is not only very affordable to buy, but extremely cheap to run. The DL360e Gen8 is a must have for Datacenters, Homelabs and SMEs alike. Featuring a Dual-Socket Intel Xeon E5-2400 V1 & V2 motherboard with options of Quad, Hex or Eight Core processors and up to 20MB Cache the DL360e G8 offers the necessary upgradability for expanding businesses. Sporting 12 DDR3 slots this compact 1U will accept up to 1866MHz ECC Registered RAM and has a max capacity of 384GB. On the storage front the HP Dynamic Smart Array B120i controller supports 8 SFF/4 LFF SATA HDDs or SSDs drives or take the HP Smart Array P420i upgrade option for added SATA III, SAS II & Single Drive Pass-Thru (JBOD) compatibility. Onboard 4-port 1Gb Ethernet is built in and management is taken care of by HP’s superb iLO4 (Integrated Lights Out 4) Management Engine. The DL360e redefines essential for datacenters with key serviceability features for in rack maintenance. This quiet 1U servers doesn't only impress in the rack, but does so on the desk, the system generates very little ambient noise (~35DB Operating) making it the perfect system for offices with enterprise needs. Bargain Hardware receive regular shipments of G8 ProLiant rack servers as our corporate clients upgrade their data centres and server farms. Every component is tested and re-stocked, allowing you to select your desired configuration or alternatively select from one of our special preconfigured deals when available, using our Configure-To- Order options below.